What is another word for impulsive? 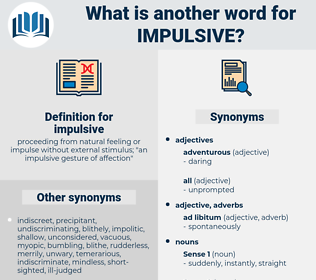 proceeding from natural feeling or impulse without external stimulus; " an impulsive gesture of affection"
deliberate, thoughtful, cautious, planned, calm, heedful, Considering, premeditative, wise. hardheaded, changeless, inflexible, fast, fixed, sound, resistible, hard-boiled, unforced, hard-and-fast, earthy, undynamic, invariable, induced, controllable, pragmatic, no-nonsense, sobersided, settled, reasonable, down-to-earth, practical, unvarying, sensible, unrelenting, tough-minded, sane, voluntary, steady, sober, logical, Grounded, immutable, steadfast, stable, unalterable, rational, equable, unbending, nonarbitrary, adynamic, unarbitrary, unyielding, manageable, unchanging, constant, matter of fact, commonsensical, established, levelheaded. Almost at once she regretted her impulsive decision. As a general rule, the impulsive person is well supplied with fears, and if he is given time to think the matter over his lack of courage begins to assert itself.